Lots and lots of great races at last summer's Saratoga meet. Lots and lots of extraordinary and extraordinarily thrilling performances. But the very best of the best--the top of the Top Ten highlights--was easy for me. This was a blockbuster of a race, an electrifying finish, a magnificent horse, and okay, he's also my sentimental favorite. I'm not a huge fan of the Travers. In fact, despite having season seats, I've always skipped Travers Day before. Don't care for crowds, the rowdies that invariably show, the long lines to bet (and everything else), and the often miserably hot and humid weather. Watching at home or at the OTB Teletheater (now Clubhouse Racebook) has been my preference. Not only that but, let's be frank, it has usually not been a particularly good race in recent years. The stars have not been there, or racing like stars. BUT last summer? What a race!!! So happy that my wife and I decided to brave that crazy day at the track. The entire day was great--yes, despite the crowds and long lines. Lots of great fun and great racing. And the Travers itself? Incredible. About as good as it gets. Just consider the line up. Among the entries were Kentucky Derby winner Orb, Jim Dandy (the month before at Saratoga) and Belmont Stakes winner Palace Malice, Wood Memorial and Haskell winner Verrazano, Dwyer runaway winner Moreno, Virginia Derby winner War Dancer, Curlin Stakes winner Romansh, and hard charging Kentucky Derby runner-up Golden Soul. And then there was Will Take Charge. (I'm affectionately calling him "Willie.") 8th in the Derby. 7th in the Preakness. 10th in the Belmont. But he still had believers. The pedigree is there. He's the son of Unbridled Song and Take Charge Lady--that's the granddaughter of Secretariat's daughter, Sister Dot. And, despite Willie's poor showings throughout the triple crown races, there were some who stubbornly insisted that he was a very talented, promising, still growing, late maturing prospect. Was that assessment ever correct! He had won the ungraded Smarty Jones at Oaklawn in January, and then the Grade 2 Rebel at the same track in March. In the latter, he showed his developing form by coming from behind to pass front-runner Oxbow (who would later go wire-to-wire to win the Preakness). 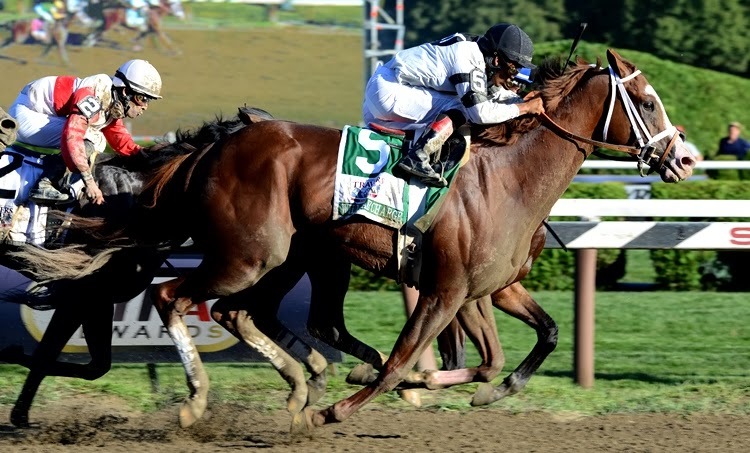 A month before the Travers, in the final jewel of the triple crown, the Belmont stakes, he had finished second to Belmont Stakes winner Palace Malice (and ahead of 3rd place Moreno). But he did so in a fast-closing style that would become his signature. Then the Travers. One of the most, if not THE most talented field of the racing year. With Luis Saez in the irons, Willie coasted in mid-pack, a few lengths from Moreno who ran in front from the gate. 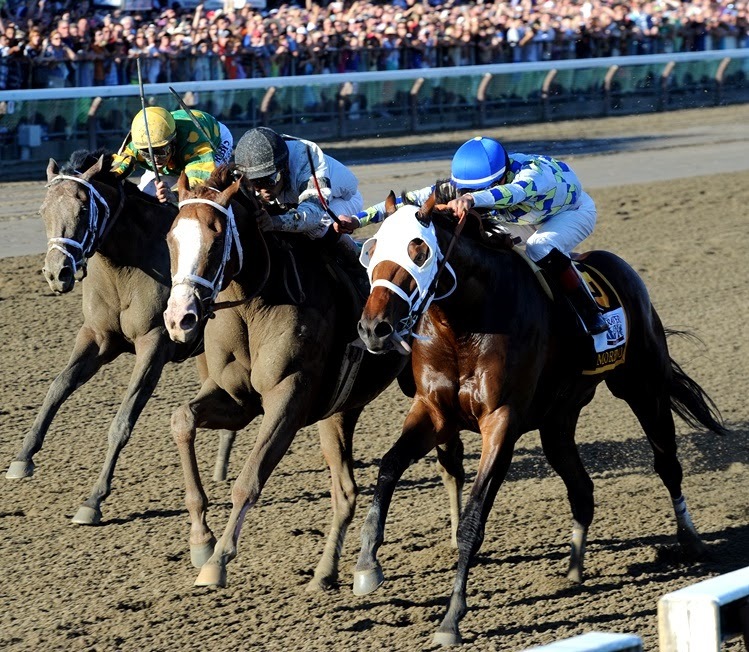 At the far turn, Willie was still 5th behind Moreno, Romansh, Verrazano and Orb, in that order. But as they entered the stretch, Willie was taken wide and began his move. Orb, on the rail, challenged Moreno and briefly took the lead. But Willie was gaining on them both. As Moreno regained the front, Willie's closing charge turned furious. Then, having passed all his competition but Moreno, the duel was on in deep stretch. Within feet of the finish line, Willie was dead even with Moreno and then--ever so slightly but no less surely--his head was bobbing in front of Moreno's. 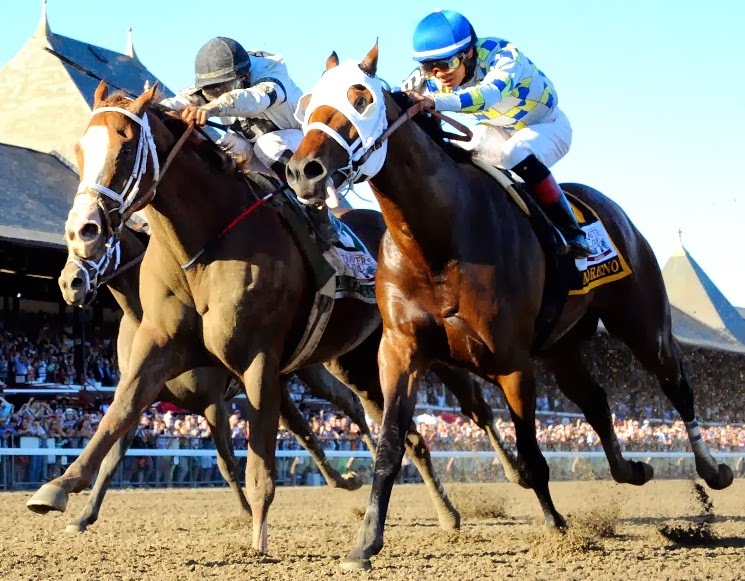 At the photo finish, it was Willie by an official "nose"--but an unmistakably widening one. A few more feet, and it would have been a head or more. This was a truly great performance! Actually, at least 2 great performances. That of Moreno as well as that of Willie. But also that of Orb who finished 3rd, albeit by a diminishing nose ahead of Palace Malice who, despite his stumble at the start, was charging at the end like Willie. Willie Victorious by a (widening) "Nose"
This was one of the great Travers. Certainly the best in many years in terms of entries and performances. And it was not the least bit marred by the thoroughly discredited accusation by Moreno's trainer that Luis Saez used an electric buzzer on Willie to give him an extra jolt at the end. Indeed, Willie made clear he needed no buzzer--or any other alleged nonsense--when he handily beat Moreno in their return match a month later in the Pennsylvania Derby. Again, in mid-pack most of the race, Willie was taken wide and breezed by all the competition--including Moreno who had been the frontrunner. Next up for Willie was the Breeders' Cup Classic in Santa Anita against older horses. Running 6 wide from 6th place--yes, he always seems to run a much greater distance than his competition--Willie closed again with a fury and readily passed them all except Mucho Macho Man who won by a very diminishing nose. Yes, many of us love MMM. But to be blunt, if the race were a foot longer, Willie would have won. In fact, it wasn't so clear that he didn't win. IAE, another extraordinary performance. To show that he was the real thing, Willie took on older horses again a few weeks later at Churchill Downs in the Clark. This time, mid-pack, 5 wide, passed the rest, including the marvelous Game On Dude by a head after a thrilling stretch duel. Yes, this is a great horse who ran his first great race at Saratoga in the Travers. He certainly earned his Three Year Old Eclipse Award with that performance and those that have followed. (As this post is being finished, Willie finished 2nd in a field of 11 in the Donn Handicap at Gulfstream. In 6th and 7th place in the backstretch, Luis Saez took him wide (as is now the custom) and he immediately started gobbling up the field. Mid-stretch, it was just Willie chasing the leader. But Lea reached the finish line (in a Gulfstream record time) before a gaining Willie could reach him. The winner ran a beautiful race, but Willie had put in another stellar performance, especially considering the extra distance he once again ran. 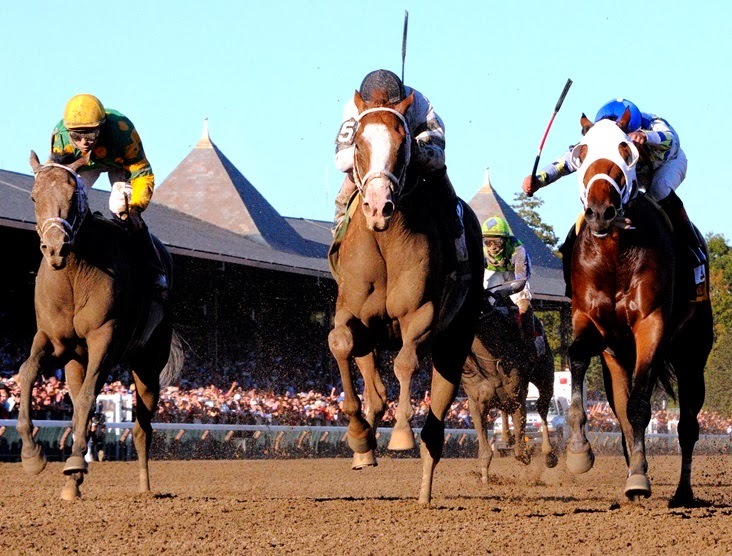 In the next Saratoga Highlights post, we'll look at #'s 2 and 3 on the Top Ten.